tDCS – The Must-Have Tool of the 21st Century? 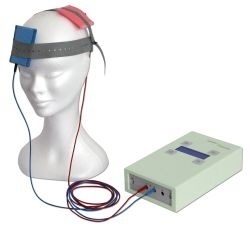 I’ve been completely fascinated by tDCS since I first learned of it a couple of months ago. What other technology is so simple yet has the potential to help so many – whether it be to treat depression, Alzheimer’s, ADHD, or just dramatically improve the ability to learn almost anything. What else does all of that with almost no risk or side-effects? Why this isn’t the lead story on the evening news and your local paper is hard to explain. Briefly, tDCS involves running a tiny current (1 to 2 milliamps) through the skull via saline soaked sponges. For healing, typically a daily 20 minute treatment is repeated for 30 or 60 days – though there is wide variation depending on the objective of the treatment. Learning session may involve 30 minutes of tDCS once per day. Enhanced learning continues for up to hours after the tDCS session has ended. Studies show enhanced retention months later. Because buying a tDCS unit normally requires a prescription and commercial units cost many hundreds or thousands of dollars, lots of amateurs have taken to building their own units – typically for $20 – $100. 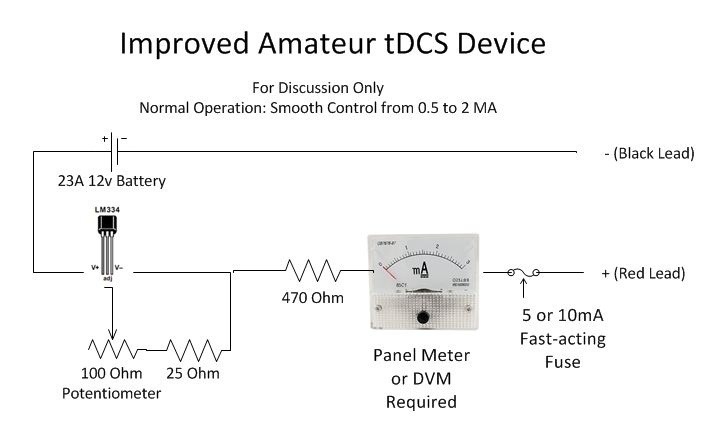 The best, very simple tDCS design I’ve seen is below – but there are probably plenty I am not aware of. The design below uses a type 23a small 12 volt battery instead of the more common 9 volt battery. Finally, there are interesting questions about tDCS that educators will have to deal with in the coming years. tDCS, as a learning technology, has been clearly shown to improve learning speed and retention in significant ways. High-schoolers and college students are figuring this out (see YouTube and elsewhere.) So how will we advise young people when it comes to tDCS use? Will students check out tDCS units like they would a laptop from the school media center? What about students who use it and excel vs. students who don’t and struggle? (A new kind of haves and have-nots.) 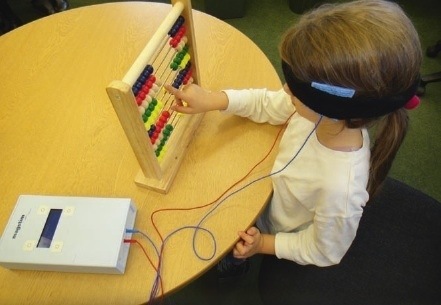 There is a whole range of questions that will have to be tackled – tDCS WILL become a factor in the world of education – soon. For anyone interested in tDCS, my best recommendation is to read, read, read. There is a wealth of information on the web and more appearing constantly as new experiments are performed and studies are published. Stay tuned, this is important! I started learning about tDCS earlier in the year. And I agree with you, I cannot understand why the mobs are not breaking down the door of the FDA demanding that they allow commercial (read safety certified) devices. I went a little farther and began designing one myself (I’m using my prototype right now actually). I will have a manufactured unit in a month or two (see http://www.dcstimulator.com). To sell to who, I am not sure yet. The regulation process to expect would be FDA regulation of tDCS devices for clinical use (which would require a doctors note). And the device acceptance could cost 10’s maybe 100’s of thousands of dollars; a process that a small company like mine could not undertake. Oh yeah, regarding your design in this blogpost, it will work, but without any true current regulation, there will be a need to adjust the potentiometer every time you put the electrodes on as the resistence of the electrodes/head varies greatly between treatments and within treatments. I use current regulating diodes, they output the same current with a varying input and a varying load. Thanks for all your work on this. I learned a lot from you. This is a GREAT article and should be required reading for anyone considering, researching, or using tDCS.